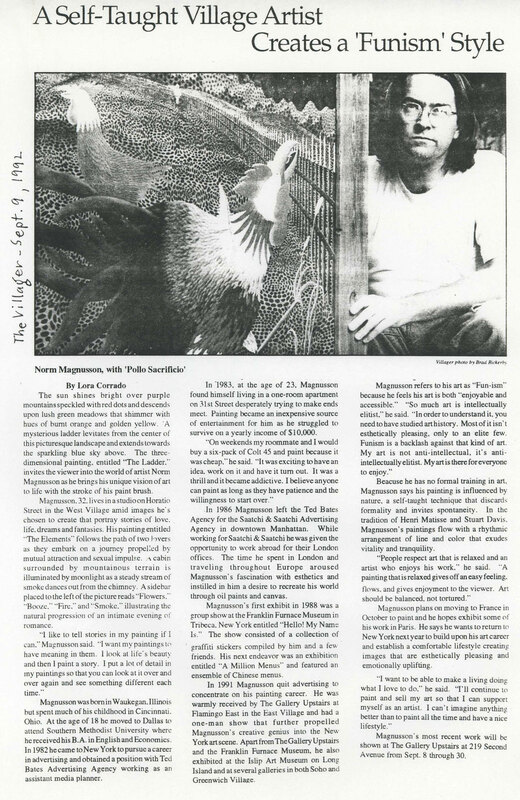 Norm Magnusson (born March 20, 1960) is a New York-based artist and political activist and founder, in 1991, of the art movement funism, he began his career creating allegorical animal paintings with pointed social commentaries. Eventually became more and more interested in political art and its potential for persuasion. This led him away from the canvas and into the public realm where he created short videos that ran on U.S. national television prior to 2004's U.S. general election, viral emails and roadside historical markers with contemporary social content. The markers are part of the artist's proposed "New York State Thruway Project". Scheduled for 2012, it will place one marker in each of the 27 rest areas up and down the length of the NYS Thruway. In the permanent collection of The Museum of Modern Art (Franklin Furnace Artist's Book Archive), The Springfield Museum of Art, The Anchorage Museum of History and Art, The Pember Museum  and numerous other public and private collections, he has exhibited at these museums and for many years before it closed, at the infamous East Village-born Bridgewater/Lustberg Gallery in NYC. His sculptures of historical markers were shown as the Aldrich Contemporary Art Museum's 2007 Main Street Sculpture Project, a show entitled "On this site stood." In his review of that exhibition for The New York Times, Ben Gennochio called Magnusson "The Michael Moore of the highways" for the very liberal "unsparing and pitiless candor" of his art, which focuses "our attention on pressing contemporary social and political issues." Rob't Hass, a sculpture by Norm Magnusson from his I-75 Project. He has also created a body of nature-based work entitled "Decorating nature" in which he paints on rocks and leaves and trees and photographs them in their environment. He was honored with a Pollock-Krasner Foundation grant in 1999 and a grant from the Lower Manhattan Cultural Council in 2008 for the realization of "On this site stood - lower Manhattan" a project to put 'historical' plaques with contemporary social content around lower Manhattan in summer 2009. (link below) In 2014, he received a NYSCA grant (through the Center for Sustainable Rural Communities) for a public art installation in Schoharie County, NY. In 2015, he was awarded a NYFA fellowship for sculpture. Beasley, Jim, Norm Magnusson, American Painter. Springfield, MO: The Springfield Museum of Art, 2000. Borum, Jennifer, Norm Magnusson Travelogue. New York, NY: Bridgewater/Lustberg Gallery, 1997.